Boon Pha Wet (บุญผะเหวด) is Month #4 of Heet Sip-Song – The Twelve Isan Merit-Making Traditions. The being who would eventually become the Buddha lived, he tells us in the Pali Canon, over 100,000 lives before reaching enlightenment. As the Buddha he recounted many of his past lives (called "Jataka" in English; chadok in Thai) and 547 stories about them have been formalized into their own chapter in the Pali Canon. Most of these are morality tales in which the Buddha-to-be somehow saves the day, overcomes a foe, or sets someone on the right path, often using supernatural powers. They share much in common with Aesop's Fables and other ancient folktales. The final ten of these Jataka Tales illustrate his mastery of the ten "perfections of character" required for one to become enlightened. The stories of these ten Jataka are very common subjects of temple murals across Thailand with the final Jataka (Vessantara Jataka in English; wetsandon chadok in Thai) appearing in nearly every Isan temple that has mural paintings. The "Wet" in Pha Wet is short for Wetsandon and "Pha" is the Isan language version of the title Phra ("Venerable") used for monks and other holy people. The Vessantara Jataka's perfection is generosity (dana), and it's no surprise that people living a difficult life in a harsh land prone to droughts and floods, where villages could not survive without everyone relying on each other, would form such as strong connection with this legend. However, the story of Prince Vessantara giving away all his possession, including his wife and children, is very entertaining and this too, no doubt, played a role in it becoming such a deeply engrained part of Lao-Isan culture. The story also relates to keeping promises, which is a habit that village leaders are expected to have. From a Buddhist perspective, generosity is linked to non-attachment, the most important principle of dharma, and lay people and monks depend on the generosity of each other to maintain a temple. Up to the mid-20th century, Boon Pha Wet was the most important of the twelve heet. Though that distinction now belongs to Songkran, Boon Pha Wet is still a very important celebration and along with Kathin, it's the most important merit-making event on the calendar. The celebration usually lasts two days, but it's now sometimes squeezed into a single day. Preparation begins weeks in advance and the day before is a busy day of decorating the temple and preparing for the parade. Often people invite Phra Upakut, a powerful supernatural monk whose spirit will protect the ceremonies from any possible intervention by the evil demon Mara. 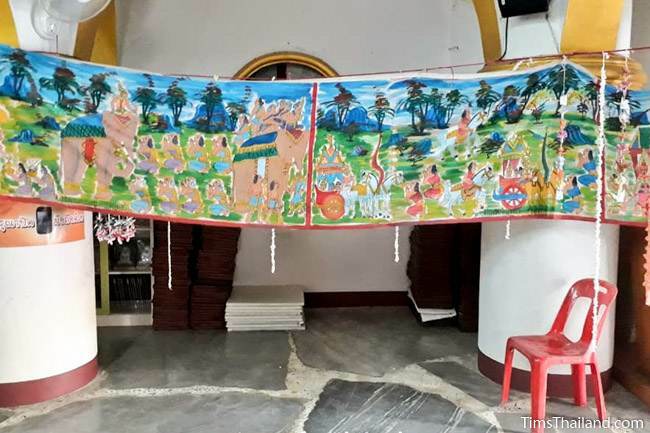 The highlight happens on the first day when a long scroll (usually from 30 to 50 meters long) with the Vessantara Jataka story painted on it (it's essentially temple mural paintings done on fabric) is paraded around the village and taken to the temple. This procession symbolically recreates the story's conclusion when Prince Vessantara returns home from his banishment to the joy of all and the rains came to the kingdom, ensuring prosperity. People dressed as Prince Vessantara and his family and also as the evil brahmin Jujaka (Chuchok in Thai), the man who took the prince's children to be his slaves, lead the procession out to the "forest" - it doesn't need to be a real forest, any place outside the village will do. The children are returned to their parents and people call for rain by splashing water. Back at the temple, the banner is hung in a wihan meeting hall (sala in Isan language) and here people gather to listen to monks tell the legend of Phra Malai, a mystical monk very popular in Thai folklore who once traveled to heaven and hell. In the former he met Maitreya, the next Buddha. Maitreya told Phra Malai to tell people on earth that they could be reborn when he has come to earth as the next Buddha if they, amongst other things, listened to the Vessantara Jataka in a single day and donated one thousand of something to the temple on that day. And these are the second day's two main activities. Day two of Boon Pha Wet begins before sunup. People gather at the temple to make their special "one thousand" donations. These will almost always include one thousand balls of sticky rice, but there will also be thousands of other things for decorating the temple such as joss sticks, flags, and lotuses. One thousand is to represent the number of stanzas that the story itself says it contains; although the Vessantara Jataka actually has far fewer – the standard version (the one used by the Pali Text Society) has 786. Many Jataka tales use large round numbers like this instead of just saying "a lot." The Isan belief is that if these donations are not made there will be lighting in the sky, but no rain will fall in the coming year. The reading of the Vessantara Jataka begins after the monks' morning meal and lasts most of the day. The task is divided amongst many monks, often dozens, and the story may be broken into a number of parts that matches the number of houses in each particular village. People who don't want to listen to the story again will go about the village securing donations for the temple. Boon Pha Wet has no fixed date. It is often celebrated together with Boon Khun Lan as a single festival.